Originally uploaded by Squid Rosenberg. Here is how to amuse a 14-month old baby indefinitely: use your OCD laundry skills to place precisely folded dishtowels in the drawer. Then watch the baby take them out. 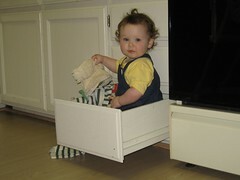 Then watch the baby get in the drawer herself. Then watch her lean out and pull all the now-destroyed towels back in with her. Then watch her get out. Then watch it all happen again.